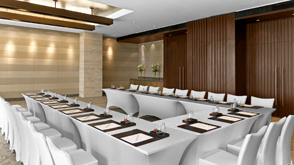 Situated in a popular shopping belt, MG Road, which boasts 10 malls within a 2 km area, is The Westin Gurgaon. It offers spacious and modern rooms, as well as an outdoor swimming pool and a gym. Featuring muted colours, air-conditioned rooms at The Westin Gurgaon are equipped with a flat-screen TV with DVD player, ergonomic work station, in-room safe and an iHome docking station. Free bottled water and a tea/coffee maker are provided. The private bathroom has a bathtub, shower and hairdryer. Facilities at The Westin include Heavenly Spa, which offers a menu of relaxing treatments and a 24-hour business centre. Westin Workout Fitness Studio is the resident wellness centre. The outdoor pool, set amid a landscaped garden also features a lounge, sundeck and poolside food and beverage service. Hotel standard check-in at 14:00 and check-out at 12:00. Currency: The Indian rupee (INR) is the official currency of the Republic of India.